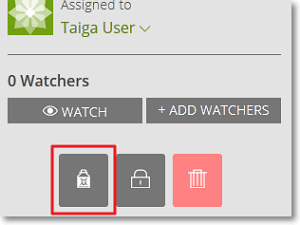 In Taiga, the user working on a Task can signal to the rest of the team that he/she is working harder than usual or may be overwhelmed by the amount of work and has taken an imaginary dose of Iocaine. To take an imaginary Iocaine dose for a Task and mark it accordingly, on the details page of the Task, on the Sidebar, click . The Task is highlighted accordingly on the Related tasks list of the User Story to which it belongs and on the TASKBOARD (if the User Story to which it belongs is part of a Sprint).